The Nutrition Education Store has a new poster! 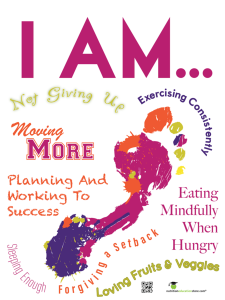 The “I Am” poster is supportive and includes great messages about staying on track and not giving up. This motivational health poster emphasizes the steps on your journey to a life of health and well-being. Affirmations serve as gentle reminders for self-care (sleeping enough, forgiving a setback), diet (eating mindfully when hungry, loving fruits & veggies), physical activity (moving more, exercising consistently), attitude (not giving up), and intention (planning and working to success). These key phrases call out to people, encouraging them to slow down and read the poster. They recognize which steps they’ve taken and which ones may need more attention. Above all, they’ll realize that “I Am” in charge of taking these steps to the life I want to live. Your journey to a healthier life takes planning and work, and starts with one step. Success comes from taking care of yourself, being kind to yourself, and not giving up. Physical activity means getting into the habit of moving more. Eating well means eating mindfully and learning to love healthy foods. Great for the classroom, gym, office, health fair, hallway, employee break room and more! This poster is great for supporting all employees, clients, students, and patients on their journey to better health. It is part of a new diet and lifestyle motivational poster collection.